Professor Joss Bland-Hawthorn is only the third Australian to win the Jackson-Gwilt Medal in its 115 year history. Professor Joss Bland-Hawthorn, from the University of Sydney's School of Physics, has been awarded the prestigious 2012 Jackson-Gwilt Medal by the UK's Royal Astronomical Society. The Jackson-Gwilt Medal is one of four major awards offered by the Society and has been awarded since 1897 for the invention, improvement, or development of astronomical instrumentation or techniques, and for achievement in observational astronomy. The medal is named after Hannah Jackson née Gwilt, who was active in astronomy in the 1800s in London. Professor Bland-Hawthorn will receive his medal from Professor Roger L. Davies, President of the Royal Astronomical Society, at the National Astronomical Meeting in Manchester, UK, on 28 March. "I feel very honoured to receive the Jackson-Gwilt Medal for my work in developing technology for space and ground based astronomy," Professor Bland-Hawthorn said. "The award is also recognition of Australia's long history in innovation in astronomy." Only the third Australian to win the medal in its 115-year history, Professor Bland-Hawthorn was selected as the 2012 winner for his work developing revolutionary technologies for astronomy which have led to new directions in astronomy and astrophysics. "I've been working in the area of astronomy technology for the past 20 years, but my most recent developments have concentrated on new instruments which make use of photonic materials and devices," he said. "We now call this area astrophotonics - a field that lies at the interface of astronomy and photonics. Astrophotonics as a discipline was featured in the February 2009 issue of Optics Express, when I published a paper with my colleague Pierre Kern on the new era for astronomical instruments offered by astrophotonics. "Some of the devices I've worked on have their origins in the telecommunications industry, but other devices, like photonic lanterns, are unique to astrophotonics." In 2011 alone, the Anglo-Australian Telescope team commissioned four revolutionary astrophotonic instruments which Professor Bland-Hawthorn has been working on - GNOSIS, SAMI, Dragonfly and PIMMS. All of these concepts will undergo more extensive development in the next few years. Professor Bland-Hawthorn is also now exploring astrophotonic technologies in the context of space instrumentation in a collaboration between the School of Physics in the Faculty of Science and the Faculty of Engineering and Information Technologies at the University of Sydney. Professor Bland-Hawthorn is a Federation Fellow in the School of Physics at the University of Sydney. 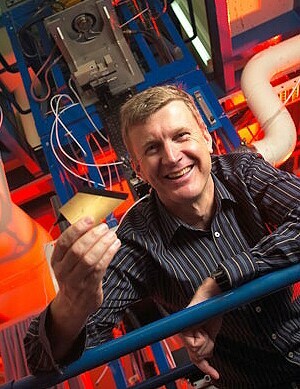 He is a member of the Sydney Institute for Astronomy and co-founder of the Institute of Photonics and Optical Science. The two previous Australian winners of the Jackson-Gwilt Medal are John Tebbut in 1905 for his work in astronomy based in the Hawkesbury and David Malin in 1986 for his lifetime contributions in wide-field photographic astronomy. Read more about the Jackson-Gwilt Medal and other Royal Astronomical Society awards.